In my ward (ward is what The Church of Jesus Christ of Latter-day Saints calls a congregation of about 300-350 local members), I've been called to serve as Cub Master for our Pack 22. I love those boys! I've been serving for about 2 yrs now. This is my 3rd Pinewood Derby and my son's 4th one (LOL he started back when he was 5, you can't make me a Cub Master and think I was going to exclude our son who was more excited for me to have that calling than I was. He's an actual Tiger now, with the Community Pack so he raced there and in ours too). Huge Success!! Cubs had fun as we raced their cars. That's what it's about, these boys! I have more pictures and more posts will follow about each of the different details, but for this post I want to dedicate it to just my Pinewood Derby Floor Plan. Because let's face it, I love it and couldn't have done it without it. No...my hand drawings would never have gotten things right. After searching everywhere online and not finding exactly what we wanted/needed, I decided to try Google Drawings for the first time and I loved it! So it's what I used to layout the Gym of our Church for our Pinewood Derby. Besides being a list person, I'm also a very visual person and needed it to be laid out before we could even try and set anything up at the church and it made it really easy to see how many people we would need as helpers and supplies we needed to get. 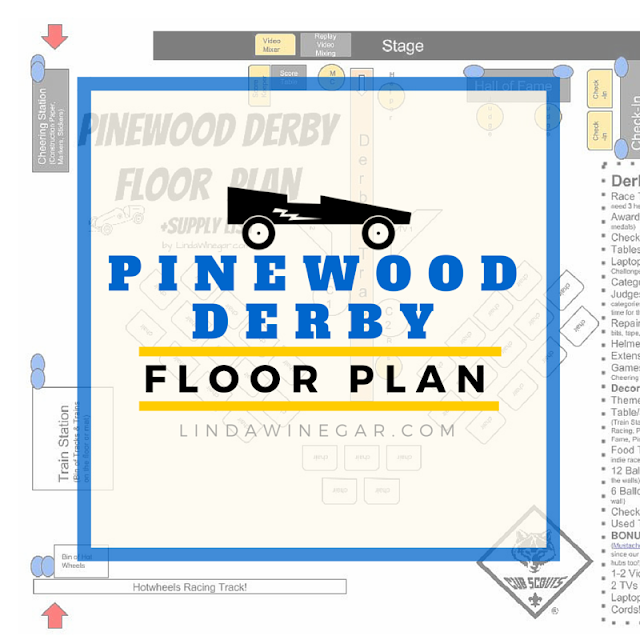 This Pinewood Derby Floor Plan (Includes the Bonus Instant Replay Setup with 1 Laptop, 2 TVs, 2 Cameras and a switcher). You'll need a Video Professional for this! (Ok maybe 2 because it's an intense job.) So grateful to have had Mustache Power Productions volunteer to come and manage that for us, the families just loved it so much! 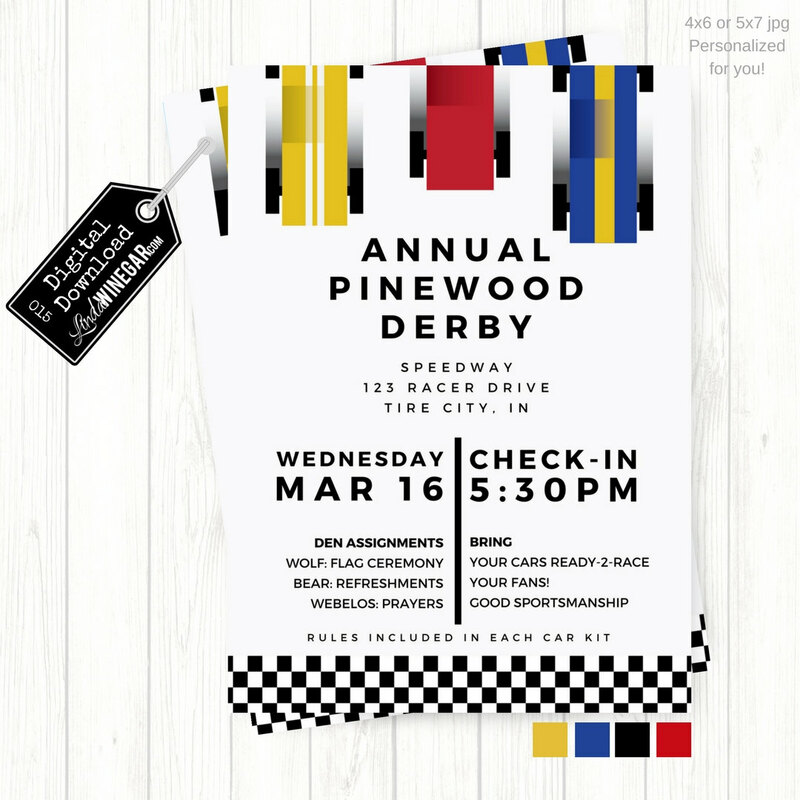 He also happens to be my husband, so it's double win for me to get to be married to such a talented man & have a ONE-OF-A-KIND / NEVER-BEFORE-SEEN / HIGH TECH Pinewood Derby! Everyone comes out to these events, even boys and parents who don't normally make it to Den Meetings or Church as often, so it's a treat to be able to see everyone and cheer everyone on! Volunteer Sign-up Sheet: I love using Sign-up Genius whenever I need volunteers for anything. I can email and text the link and people can sign up on the computer or on their phones and then the system just emails them reminders. Here's the sign-up I created and sent out! 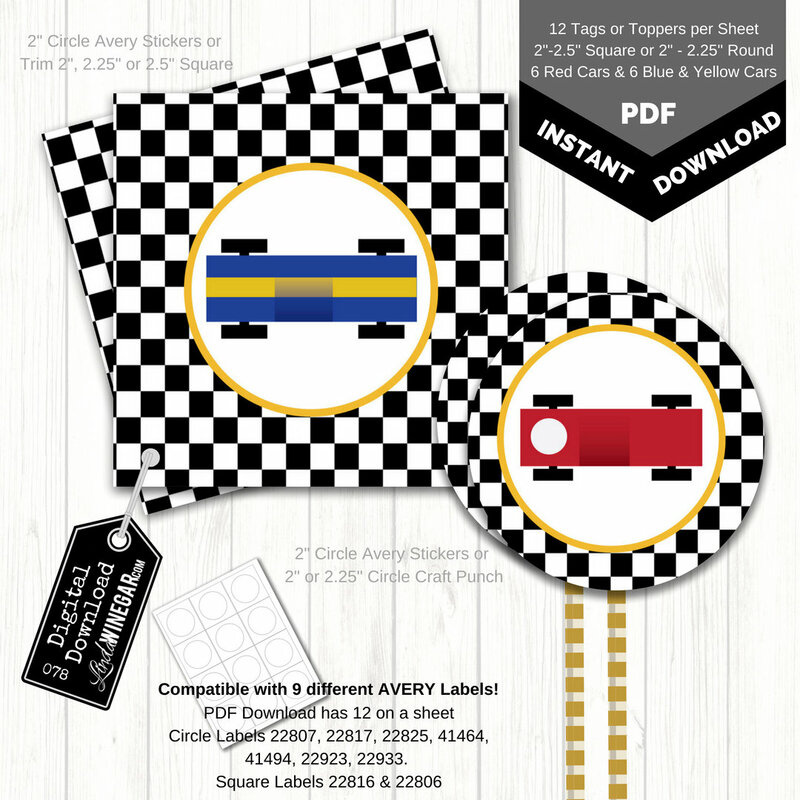 Themed Table Cloths or colored ones, if they all match that'd be awesome but sometimes the CubScout Budget or our own personal budget won't allow for it. Checkered Duct Tape! (To put on pens, pencils, clip boards, or down the table as a runner, whatever you want! 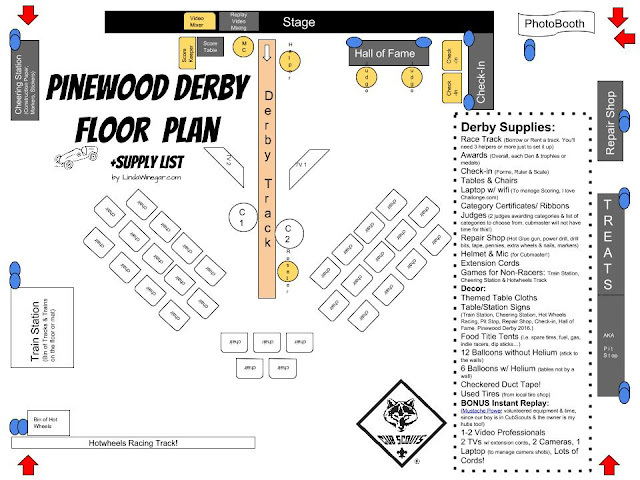 Here's the floor plan without the Bonus Instant Replay Supplies listed, with seating adjusted for viewing. Yes, you'll still get kids sitting on the floor by the end of the track, no matter how many times you tell them to move. LOL And that's why my hubby thought to use those instant replay monitors! 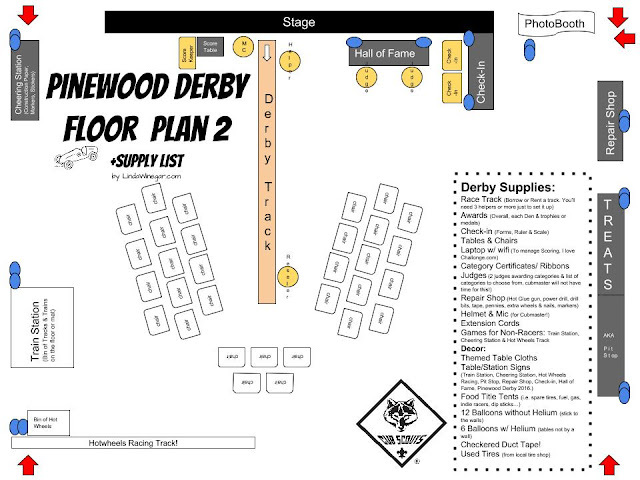 But here's the floor plan without them because I know not everyone has someone who can do that for them. Normally that kind of setup and time commitment would cost approx. $1,000. We have a pack of 21 cubs. We said Check-in @5pm, we started flag ceremony at 5:45pm, Raced (Wolves, Bears, Webelos, Tigers & found the overall winner), gave out awards and certificates, had closing flag ceremony and still ended @6:50pm. 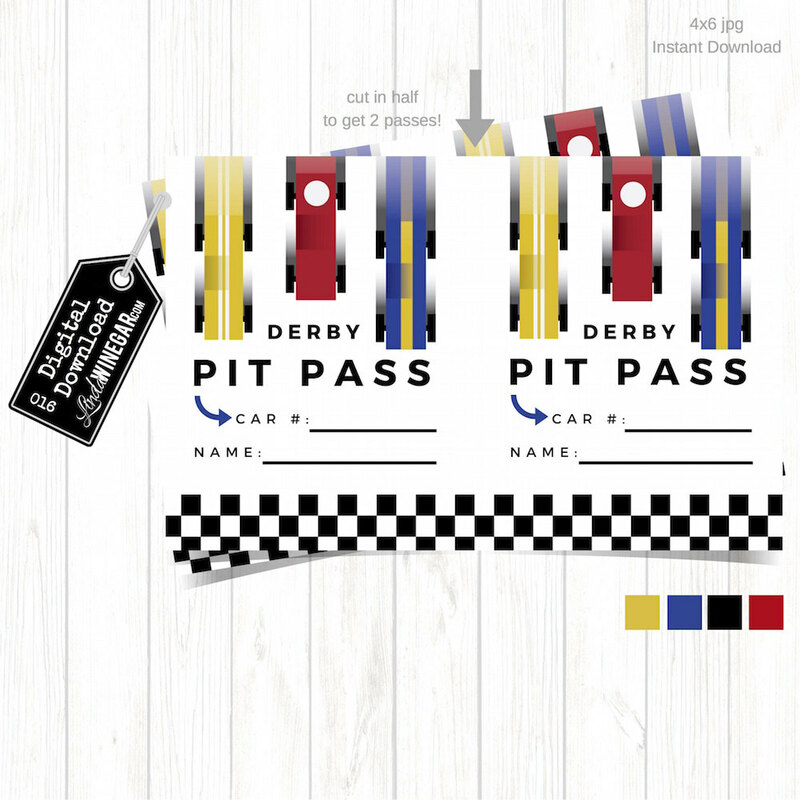 Remember, you can't plan to have anything else besides your Pinewood Derby, (no arrow of light ceremonies, no rank advancements or awarding loops, they will take more time.) You could save maybe 15 min if you started flag ceremony at 5:30pm, but we needed a little extra time for last min check-in and adjustments. We don't do check-ins the night before because a whole lot of people have keys to the building and don't want to risk losing cars. I loved this floor plan and it helped us stay a little more organized and sane. Not perfect I know but every little bit helps. Next derby I will be even more prepared and who knows what else we will add to make it even better for the boys and their families. 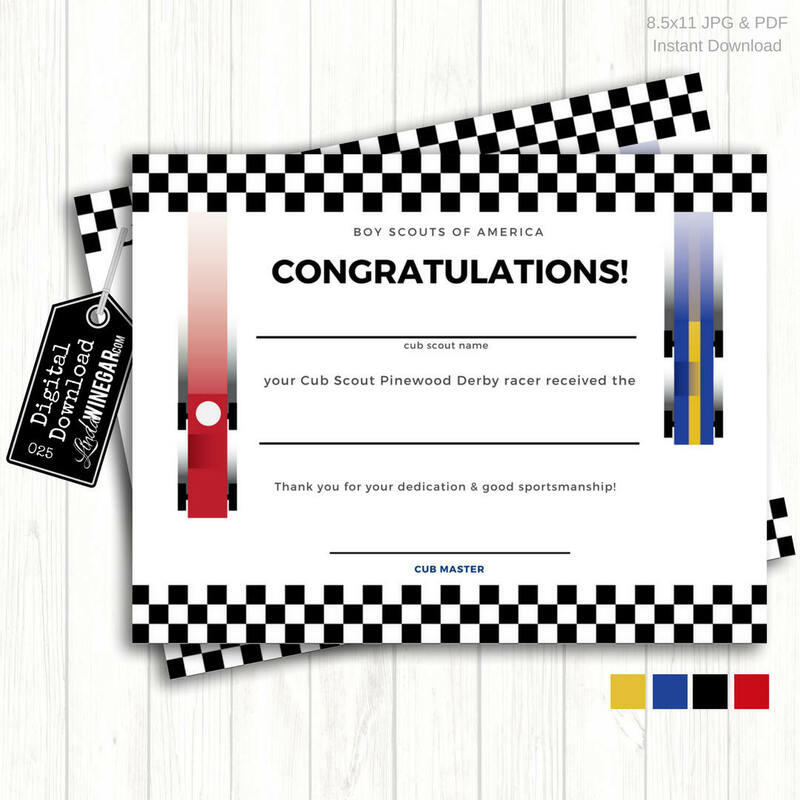 Pinewood Derby Invites, Pit Passes, Cup Cake Toppers & Certificates!